Finally a sharpener that really works! 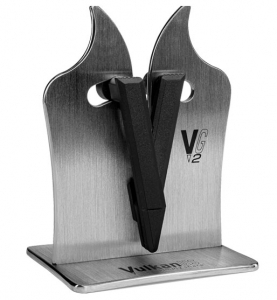 Lava presents the ultimate V-sharpener (sharpening and honing in one) that makes both, knife with a smooth blade and serrated razor, sharp in a short time and without the fully heat. The patented spring system adjusts to any cutting angle perfectly. Suitable for all kitchen knife's with a smooth edge and serrated edge. However unsuitable for ceramic knives. Delivered in plastic or heavy duty stainless steel. Knife is not included.